Learn the techniques and strategies that will help you excel at part 7 of the Reading and Use of English paper , i.e. the gapped text exercise. 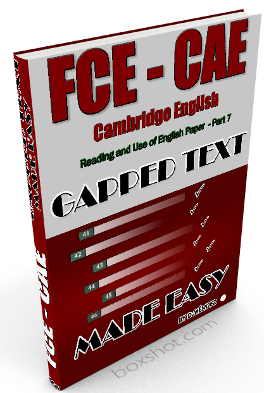 This book has been written to help students prepare for part 7 of the Reading and Use of English paper of Cambridge English FCE and CAE exams. It will show you how to approach the test in a different and more effective way. You will learn many techniques and strategies that are not taught anywhere else, the kinds of things that are learnt by doing dozens of gapped text exercises and analyzing the whys and hows of every answer.